Section of 1880 rail made by Krupp. Retrieved from Margarita River canyon near ranch house. On display at Reed's Hobby Shop, La Mesa CA. The Camp Pendleton Railroad was formed from the old Fallbrook branch of the Santa Fe Railroad. Constructed in 1881, it was operated at first as part of the original transcontinental main line of the Santa Fe from San Diego to Chicago. The line was constructed by the California Southern Railroad, a Santa Fe owned subsidiary, from San Diego north to Fallbrook junction just north of Oceanside. This part of the line still exists under the ownership of the San Diego Northern. From Fallbrook junction the line turned inland and followed the Santa Margarita River all the way to Temecula where it turned north and eventually was built into Riverside and up Cajon pass to connect with the Atlantic and Pacific Railroad at Barstow. Click here for a map of the California Southern as it appeared in 1885. The choice of the surveyors to follow the Margarita River has proven over the years to be a very poor decision. Flooding in 1891 destroyed much of the line in the canyon and resulted in abandonment of track between Fallbrook station and Temecula. In 1916, the famous Hatfield flood caused tremendous damage again. This time the Santa Fe rebuilt part of the line directly into Fallbrook itself by climbing out of the river valley near Lake O'Neal. In 1941, the Marine Corps took over Rancho Margarita and turned it into Camp Pendleton. Extensive rail marshalling facilities were built to serve the base. Special trains brought troops in and out of the base and the Santa Fe was kept busy bringing in and taking out equipment and materials. The Korean war resulted in more warehouse construction and the railroad branch settled into a routine of the daily freight that did not change until 1979 when another flood destroyed three miles of track near Ysabella station. Repairs took several years to accomplish and were paid for by the Marines. The Santa Fe had its fill of floods and wanted to abandon the line. In a complicated transaction, the tracks and right of way through Camp Pendleton and the Naval Weapons Station were quit claimed in exchange for a seventeen acre easement near Fallbrook junction and a cash payment. This put the Marines into the railroad business. Two locomotives were acquired and service began again in 1988 after a nine year absence. Click here for some photos up on the Camp Pendleton Railroad. Marine Corps operation of the railroad continued until January 1993 when a disastrous flood again caused severe damage to the tracks. At this time the Marine Corps decided to discontinue operation of the railroad and move loading and unloading services to a yard on high ground near the main gate. The Santa Fe easement was vacated and the existing yard has been returned to the Marine Corps for railroad use. The railroad through the base has been largely dismantled with the exception of a three mile section extending from the old ranch house to the east border of the Marine base. 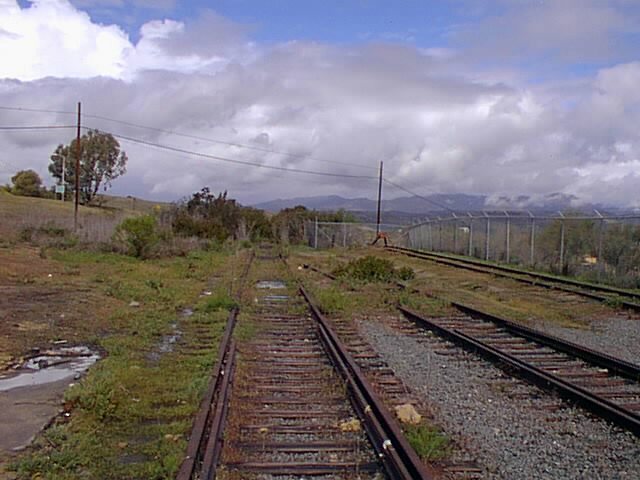 Many people do not recognize the historical link between the Camp Pendleton and the railroad. In the 1880s, when Camp Pendleton was known as Rancho Santa Margarita y Las Flores, the only train route between San Diego and Los Angeles ran through the ranch. Passage required an unusual ritual. Trains from San Diego would stop at the boundary fence for a crewman to open the gate. After passing through they would stop again to close the gate behind them. The process was repeated on the east side of the ranch as it passed on to Fallbrook and then to San Bernardino from where one could make a connection to Los Angles. Later, during World War II, the 4th Marine Division loaded its equipment on railroad cars at Camp Pendleton for transport to ships preparing to sail directly for the assault on Roi-Namur in the Kwajalein Atoll. Additional information about the Camp Pendleton Historical Society can be found at www.camppendletonhistoricalsociety.org. "We moved the loco from the wye at Camp Pendleton to the tracks in the 2600 Area. We used a 200 ton semi, and a 400 ton truck mounted crane. This is not far from The Mechanised Museum, of which the railroad is now a part of. The move was done about last February on a VERY cold day. I was in a parka and long johns, and was shivering like all the rest of the crew. All of us were volunteers, as the railroad museum is akin to a non-profit. Brewer Heavy Lift and Bill Signs Trucking, both of Lakeside, did the lifting and hauling. The History Officer, who runs all this, is USMC Civilian Ms. Faye Joanason. ( - 760-725-5758) Since most of the staff is busy with the current military deployments, nothing else will be done on this project until they return."